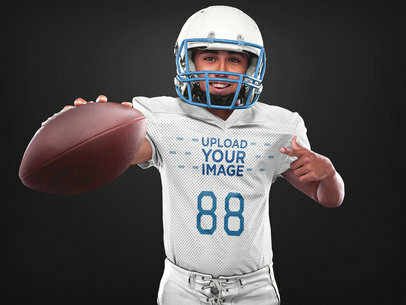 Promote your youth football uniforms using Placeit's visual assets! 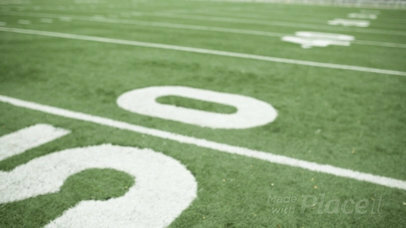 This awesome mockup features a young kid holding the ball while at the field, you can use this image to promote your latest designs in a photorealistic way. Start now, the menu on the right will let you choose his clothes' colors, then drag-and-drop your design image file over the upload button on the left side of the page. Start using Placeit now and make your income grow! Try another Football Jersey Maker or have a look at our football logo generator! Do you have any feedback or is there any other type of jersey do you want to see? Email us! 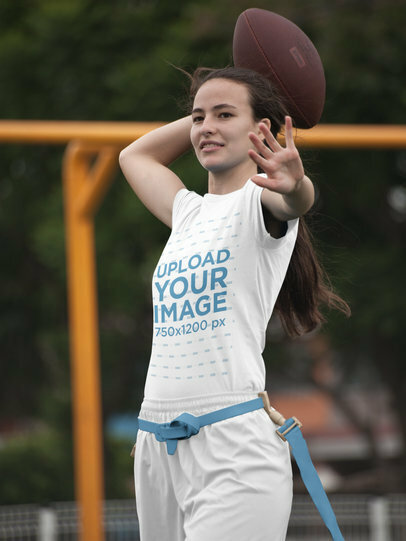 Have a glance at this beautiful football jersey maker by Placeit, it's featuring a pretty girl running through the field while holding the ball. You can edit her clothes' colors with the HEX tools on the right, then upload your design with the upload button on the left side of the page. Easy, right? Start using Placeit and promote your custom football uniforms in a better way. Try another Football Uniform Builder! Do you have any feedback or is there any other type of jersey do you want to see? Email us! Take a look at this amazing video of a folded custom football jersey lying folded on the field while near a football, you can now promote your latest design for custom football jerseys in an easy and amazing way! Use this football jersey maker from Placeit and start selling more, you just have to choose a color for the jersey with the menu on the right and drag n' drop your design image file over the interface, it's super easy! Start now using an outstanding football jersey designer from Placeit and sell more! Try another Custom Football Jersey Maker! Use this awesome football jersey maker to promote your latest designs for football custom jerseys in a unique way, use a Placeit video mockup! The menu on the right side of the page will let you choose a color for the jersey, then drag-and-drop your jpeg or png image file over the interface, it's as simple as that! A moment later you will see the processed video on your screen. Try another Volleyball Jersey Maker Video! Take a look at this awesome video featuring a football jersey lying on a white surface, it's a great visual asset that you can use to promote your latest designs in a more realistic and beautiful way! Use the menu on the left to choose a color for the jersey and to upload your design, then use the Generate button and see the preview of your video. Amazing, right? Try another Baseball Uniform Maker here! Use this awesome football uniform designer and promote your latest design for custom football uniforms in an easier and more beautiful way! Start by choosing a color with the menu on the right, then drag-and-drop your jpeg or png image file over the interface. Simple, right? Use Placeit and promote your designs with a football uniform builder video like this one! Try another Football Jersey Maker! 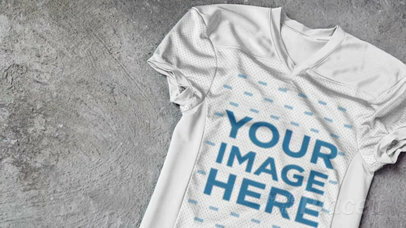 Looking for a different way to promote your latest design for custom football jerseys? Use Placeit! This beautiful football jersey maker is a great choice for you to promote your designs in a photorealistic and stunning way! The menu on the right will let you choose a color for the jersey, then drag-and-drop a jpeg or png image file over the interface. That's all! In a couple of seconds you'll see the processed video on your screen. Try another Football Uniform Builder! Use this awesome football jersey maker to showcase your latest designs for custom football t-shirts in a more realistic and professional way! It's really easy, you just have to choose a color for each part of this girl's custom football uniforms using the HEX tools on the right, then drag-and-drop your design image file over the upload button on the left. Easy, wasn't it? Try another Football Uniform Builder! Use this awesome visual asset to promote your latest design for custom football uniforms in a beautiful and photorealistic way. The menu on the right side of the page will let you choose a color for this man's custom football apparel, then upload your design with the menu on the left side of the page. Start now and amaze your audience! Try another Football Jersey Maker! Do you have any feedback or is there any other type of jersey do you want to see? Email us! Take a look at this awesome football uniform designer, it's a gorgeous visual that you can use to showcase your latest designs for your custom football uniforms in just seconds. Start now, the menu on the right will let you choose this guy's clothes colors, then drag-and-drop your jpeg or png image file over the upload button on the left side of the page. Start using Placeit now and showcase your latest custom football jerseys! Try another Football Uniform Builder! Do you have any feedback or is there any other type of jersey do you want to see? Email us! Looking for a way to promote your custom football uniforms in a simple and professional way? 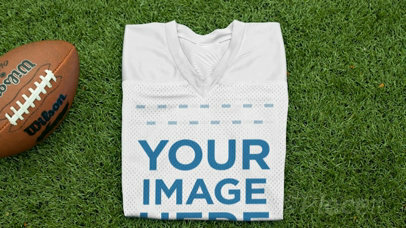 Start using Placeit's football jersey maker and amaze your audience! Just use the menu on the right side of the page to choose this jersey's colors, then upload your deisgn for it using the options on the left. Wasn't that easy? Try another Football Uniform Builder! Do you have any feedback or is there any other type of jersey do you want to see? Email us! Use this gorgeous football jersey maker to promote your latest design for custom football uniforms in a photorealistic and beautiful way. Use the menu on the right side of the page to choose this man's uniform colors, then upload your design using the menu to the left. Easy, isn't it? Use Placeit now and amaze your audience! Try another Football Jersey Designer! Do you have any feedback or is there any other type of jersey do you want to see? Email us! Have a look at this gorgeous football uniform designer featuring a man making a touchdown while at the field, you can edit this image to promote your latest design for custom football uniforms in a photorealistic and cool way. Use the menu on the right to choose this man's uniform colors, then drag-and-drop your jpeg or png image file over the upload button on the left side of the page. Try another Football Jersey Maker! Do you have any feedback or is there any other type of jersey do you want to see? Email us! Use this gorgeous football jersey maker to make your latest design for custom football uniforms in a beautiful and photorealistic way. Use the HEX tools on the right side of the page to choose this teenager's uniform colors, then upload your design for his jersey using the menu on the left. Simple, right? Use Placeit and promote your designs in a more visually appealing way. Try another Football Uniform Designer! Do you have any feedback or is there any other type of jersey do you want to see? Email us! 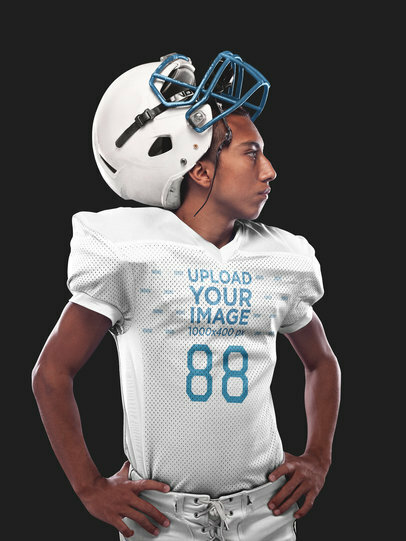 Start showcasing your designs for custom football uniforms in a cool way, use Placeit's football uniform designer and amaze your audience! Use the menu on the right to choose this teenager's uniform colors, then upload your design for his jersey using the menu to the left. Easy, isn't it? Use a photorealistic visual asset and promote your designs in a better way! Try another Football Uniform Builder! Do you have any feedback or is there any other type of jersey do you want to see? Email us! 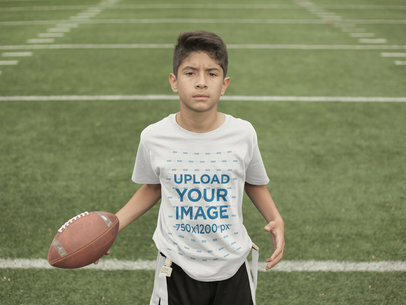 Use this beautiful football jersey maker featuring a boy holding the ball while inside the studio and amaze your audience with a stunning image showing your design for custom football uniforms. Start using the menu on the right to choose this boy's uniform colors, then upload your design on his jersey with the menu to the left. Easy, right? Try another Custom Football Uniform Builder! Do you have any feedback or is there any other type of jersey do you want to see? Email us! Use this gorgeous football uniform designer to promote your latest idea for custom football uniforms in a really cool way! Use the menu on the right side of the page to choose the colors for his uniform, then upload your design with the menu on the left. Cool, right? Start using Placeit and market your jersey designs in a better way! Try another Football Jersey Designer! Do you have any feedback or is there any other type of jersey do you want to see? Email us! 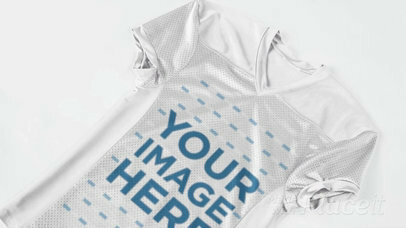 Promote your latest design for custom football uniforms with Placeit's football uniform designer! This image is a great choice to showcase your latest design for your designs. Use the menu to the right to choose this man's uniform colors, then upload your design using the menu to the left. Placeit's visuals are an excellent choice to market your jersey designs in a more beautiful way! Try another Football Jersey Designer! Do you have any feedback or is there any other type of jersey do you want to see? Email us! Have a look at this gorgeous football jersey maker by Placeit, you can now display your latest design for football custom jerseys using a gorgeous and photorealistic visual in a really simple way! Use the menu to the right to choose the colors for this man's uniform. Then upload your design with the upload button to the left. Try another Football Jersey Mockup! Or make your own Super Bowl t-shirt here! 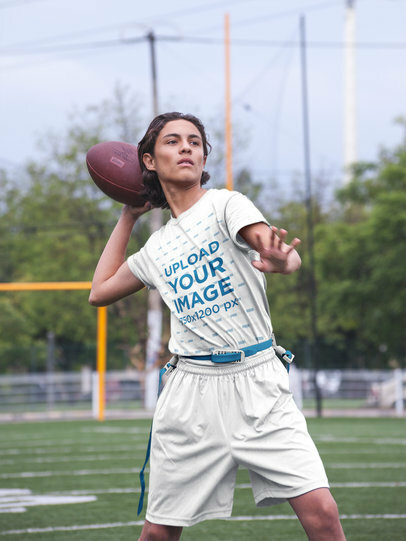 Take a look at this gorgeous football uniform designer from Placeit, you can now start showcasing your designs for custom football uniforms through a very simple and beautifully-made tool. Use the menu to the right if you are looking to change this man's football uniform colors, then upload your design with the upload button to the left. We will merge it for you with his jersey. Try another Football Uniform Builder! Or you can even create your own Super Bowl merch here! Do you have any feedback or is there any other type of jersey do you want to see? Email us! Have a look at this gorgeous visual featuring a cool dude wearing his football uniform while standing inside the studio. 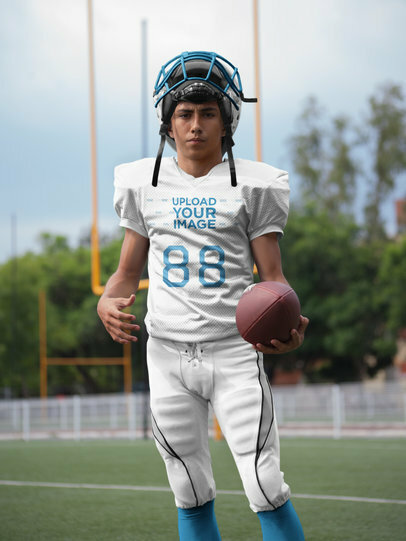 You can now promote your latest design for custom football uniforms in a great way! Use the menu to the right to choose this man's uniform colors, then upload your design for his jersey using the upload button to the left. Try another Football Jersey Designer! Support your favorite football team by making your own Super Bowl jersey! Do you have any feedback or is there any other type of jersey do you want to see? Email us! 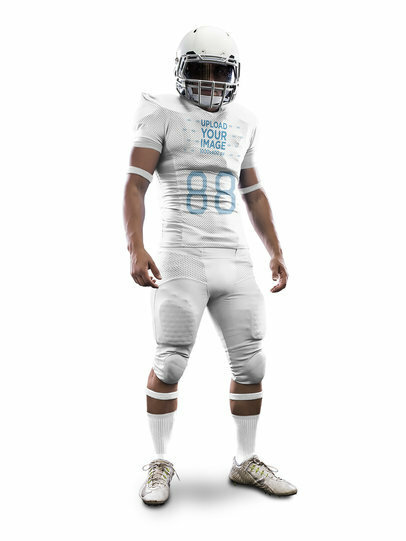 Use this gorgeous football uniform builder to showcase your ultimate idea for custom football uniforms in a very awesome and versatile way! Use the menu on the right side of the page to choose this guy's uniform colors and the background color too, then upload your design with the menu on the left. Easy, isn't it? Use this football jersey maker and amaze your audience! Try another Football Jersey Designer! Do you have any feedback or is there any other type of jersey do you want to see? Email us! 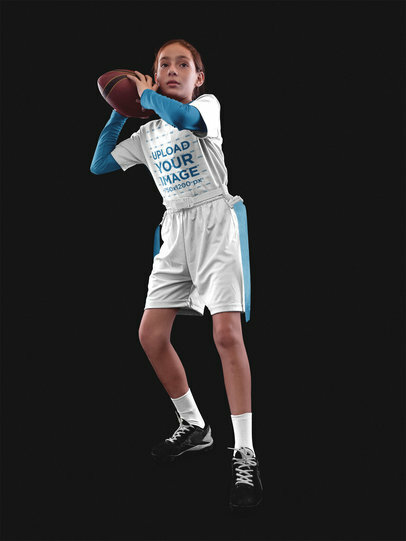 Take a look at this gorgeous visual featuring a girl standing inside a studio, she's about to throw the football. You can edit this image to showcase your latest custom football jerseys in a professional and beautiful way. Start now, use the menu on the right to choose this girl's uniform colors, then drag-and-drop your jpeg or png image file over the upload button on the left. Super easy, isn't it? Try another Football Jersey Maker! Do you have any feedback or is there any other type of jersey do you want to see? Email us! Take a look at this gorgeous visual from Placeit, you can now promote your latest custom football designs in a beautiful and photorealistic way. 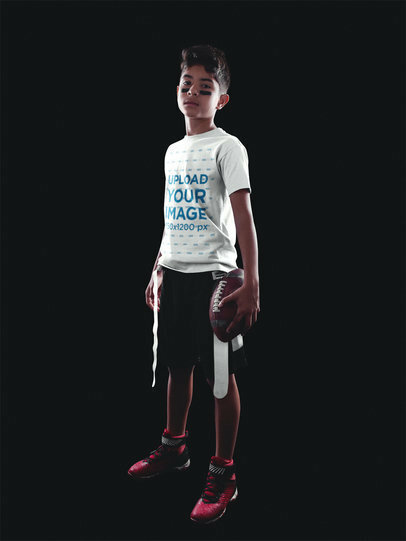 Start using this football jersey maker and display your ideas in a gorgeous way! Use the menu on the right to choose the colors of this girl's clothes, then upload your design image file with the upload button to the left. It's as simple as that! Try another Football Jersey Maker! Do you have any feedback or is there any other type of jersey do you want to see? Email us! 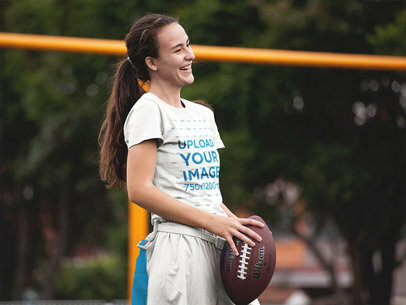 Take a look at this teen girl making faces while holding the football at the studio, you can edit this image to showcase your custom football jerseys in a beautiful and unique way. Start now, use the menu on the right side of the page to choose the colors of her clothes, then drag-and-drop your jpeg or png image file over the upload button on the left side of the page. It's super easy! Try another Football Jersey Maker! Do you have any feedback or is there any other type of jersey do you want to see? Email us! 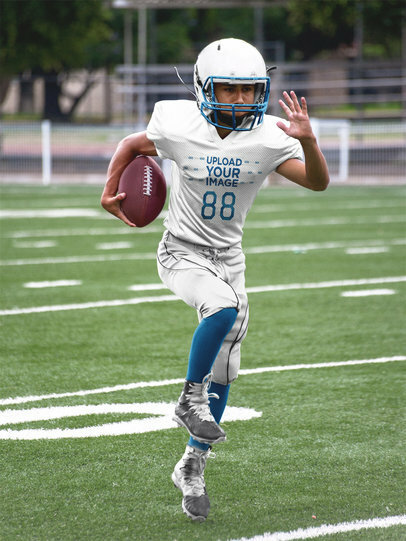 Take a look at this football uniform designer featuring a young happy girl throwing the ball while at the field, you can edit the image to showcase your latest custom football uniforms in a gorgeous way. 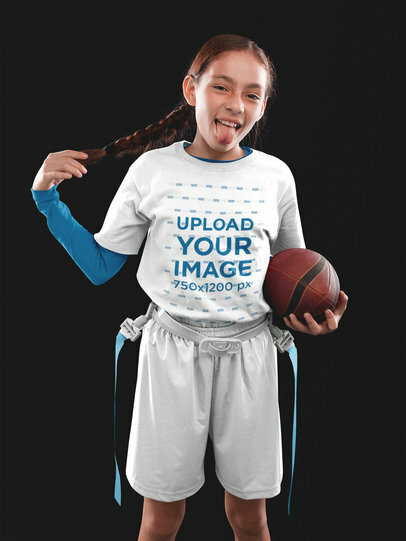 Use the menu on the left to upload your design image file, we will merge it in just seconds with this girl's tee. Then choose her clothes colors using the menu on the right. Easy, isn't it? Try another Football Uniform Builder! Need some inspiration? Check our best football logos and mockups! Do you have any feedback or is there any other type of jersey do you want to see? Email us! 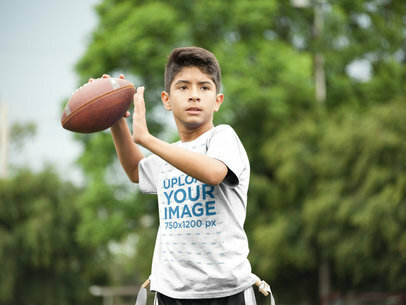 Take a look at this gorgeous football jersey maker from Placeit, it features a happy hispanic teenager posing while holding the ball at the field. You can use the menu on the right side of the page to edit his clothes' colors, then drag-and-drop your jpeg or png image file over the upload button on the left. Don't forget to share this image to showcase your custom football uniforms in a beautiful and photorealistic way! Try another Football Jersey Maker! Do you have any feedback or is there any other type of jersey do you want to see? Email us! 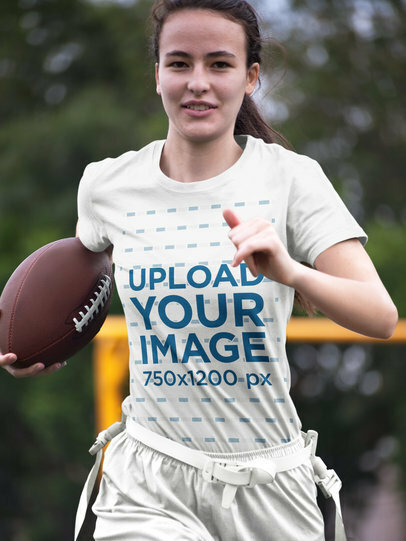 Take a look at this gorgeous visual featuring a happy girl holding the football on her hands while at the field, you can customize this image to promote your latest custom football jerseys in a simple and photorealistic way. Start now! Use the HEX tools on the right side of the page to choose the colors for her uniform, then drag-and-drop your jpeg or png image file over the upload button on the left. Easy, right? Try another Football Jersey Maker! Do you have any feedback or is there any other type of jersey do you want to see? Email us! Take a look at this gorgeous football jersey maker by Placeit, it's featuring a man wearing a custom football uniform. 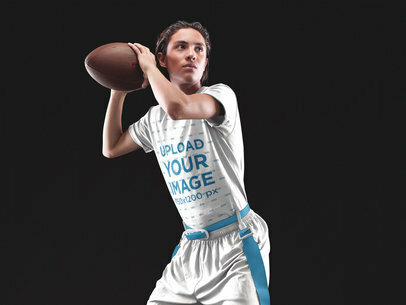 You can promote your latest design for a football uniform with Placeit's football uniform builder in a really easy way! Choose this man's uniform colors, then drag-and-drop your jpeg or png image file over the upload button on the left side of the page. While you are it, why not checking this list of the best suppliers of football team apparel! Try another Football Jersey Designer! Do you have any feedback or is there any other type of jersey do you want to see? Email us! Looking for a way to showcase your latest custom football uniforms in a beautiful and cool way? Use Placeit's football jersey maker! This beautiful football uniform builder is a great choice to do that, just use the menu on the right side of the page to choose this guy's clothes colors, then upload a design with the upload button on the left. That's all! Try another Football Jersey Maker! Do you have any feedback or is there any other type of jersey do you want to see? Email us! Take a look at this awesome muscular football jersey maker by Placeit, this custom football uniform builder will let you create your own custom football uniforms in a really easy and photorealistic way. Start now! Promote your custom football jerseys in a better way! Looking for a way to showcase your latest custom football uniforms in a visually appealing and easy-to-do way? Placeit's here for you! 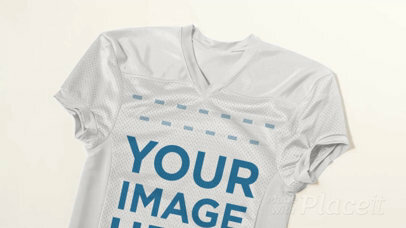 Use this beautiful football uniform builder and start displaying your own custom football t-shirts in an easy way. Start using the menu on the right to choose this teenager's uniform colors, then drag-and-drop your jpeg or png image file over the upload button on the left. Easy, right? Try another Custom Football Apparel! Do you have any feedback or is there any other type of jersey do you want to see? Email us! 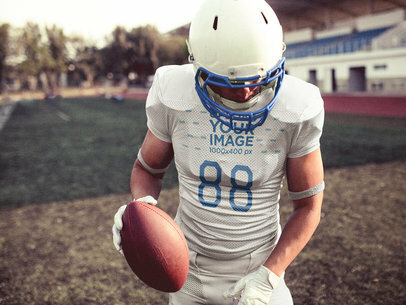 Take a look at this beautiful football uniform designer from Placeit, it's a beautiful visual that you can use to showcase your latest custom football uniforms in a gorgeous and professional way. Start now, the menu on the right side of the page will let you choose this guy's clothes colors, then drag-and-drop your jpeg or png image file over the upload button on the left side of the page. Easy, right? Try another Football Uniform Designer! Do you have any feedback or is there any other type of jersey do you want to see? Email us! 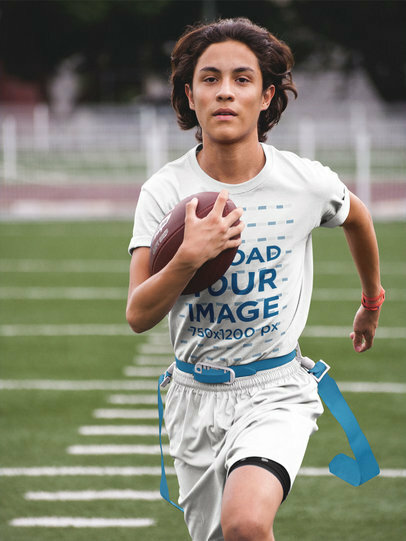 Take a look at this gorgeous visual featuring a teen boy running on the field, it's a beautiful image that you can use to showcase your latest designs in a cool and photorealistic way. Use the menu on the right to choose this guy's uniform colors, then drag-and-drop your jpeg or png image file over the upload button on the left side of the page. It's as easy as that! In just seconds you'll see the processed image. Try another Football Jersey Maker! Do you have any feedback or is there any other type of jersey do you want to see? Email us! 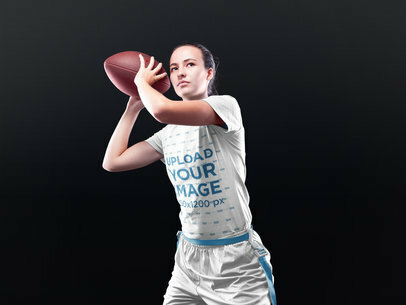 Start showcasing your custom football uniforms with Placeit's visuals! 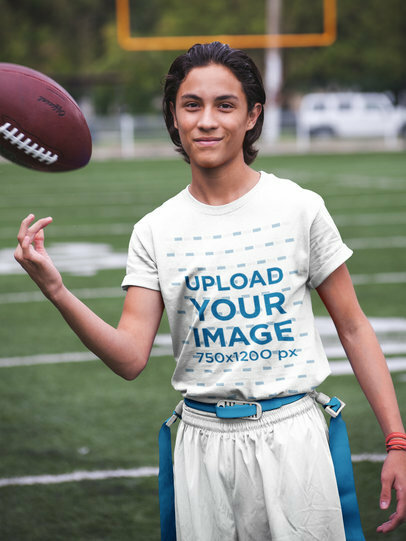 This gorgeous football uniform designer is a great option if you are looking to showcase your latest designs for custom football t-shirts in a photorealistic and cool way. Use the menu on the right side of the page to choose this guy's uniform colors, then drag-and-drop your jpeg or png image file over the upload button on the left. Try another Football Jersey Maker! Do you have any feedback or is there any other type of jersey do you want to see? Email us! 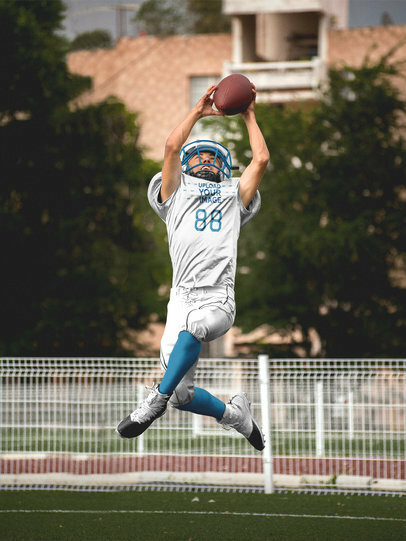 Take a look at this beautiful football uniform designer for Placeit, it's the perfect solution if you were looking for a way to promote your youth football uniforms in a smart way. Start now, the menu on the right will let you choose her uniform's colors, then drag-and-drop your jpeg or png image file over the upload button on the left side of the page. Super easy, right? Use Placeit now to promote your latest personalized football jersey in a smart way! Try another Football Jersey Maker! Do you have any feedback or is there any other type of jersey do you want to see? Email us! 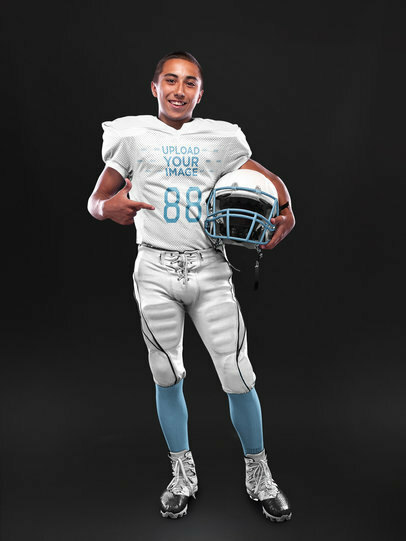 Start promoting your youth football uniforms in a better way, use Placeit! 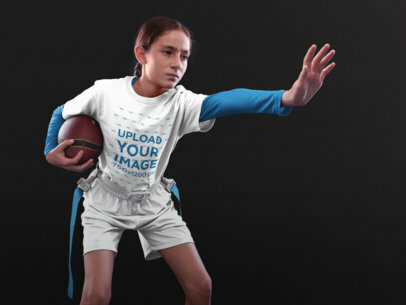 This awesome mockup features a little girl wearing her custom football uniform while inside a studio, you can edit the image to promote your latest designs in a gorgeous and high-quality way! Start now, the menu on the right side of the page will let you choose her uniform's colors, then drag-and-drop your jpeg or png image file over the upload button on the left side of the page. Share your personalized football jersey in a prettier way! Try another Football Jersey Maker here! Do you have any feedback or is there any other type of jersey do you want to see? Email us! 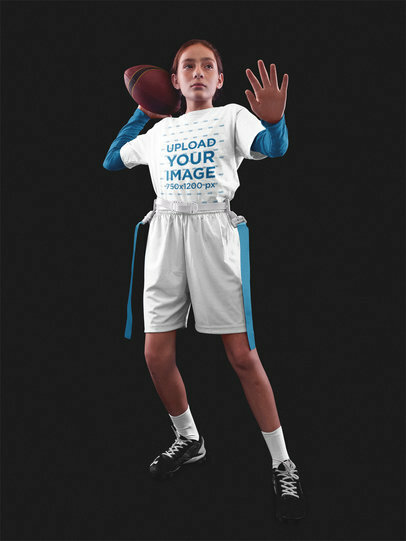 Start displaying your latest design for youth football uniforms in a professional and visually appealing way. 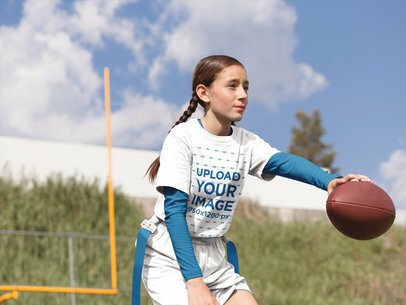 This image is perfect for you to do that, it has a teen white girl looking down at the camera while holding the football under her arm, she's also wearing her football uniform. Use it now, this football jersey maker is a great choice if you are looking to promote your latest design for your custom football uniforms. Try another Football Jersey Maker! Do you have any feedback or is there any other type of jersey do you want to see? Email us! 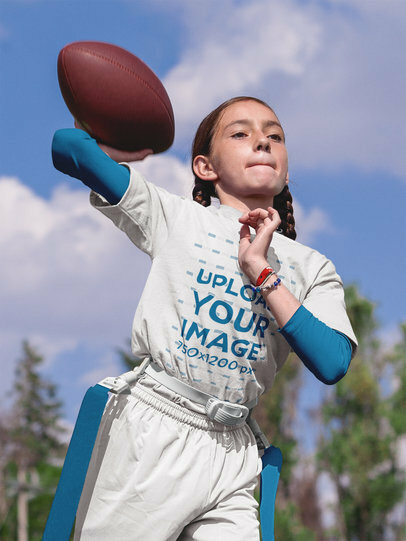 Take a look at this football jersey maker by Placeit, it's featuring a pretty little girl doing faces while holding the football in her hand. You can edit this image by choosing her clothes' colors with the menu on the right. Then upload your design using the upload button on the left side of the page. Start sharing your custom football jerseys design in an easy way now! Try another Football Uniform Builder! 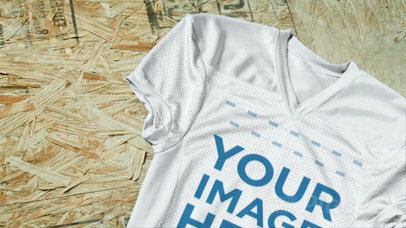 Learn how to use this football jersey mockup here. Do you have any feedback or is there any other type of jersey do you want to see? Email us! 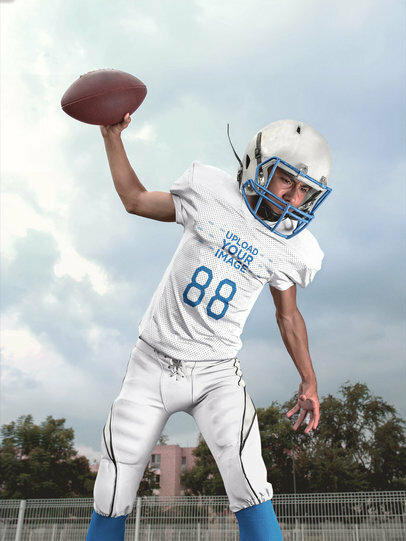 Start promoting your latest designs for youth football uniforms in a beautiful and realistic way. Start now, the menu on the right will let you choose a color for this girl's uniform, then drag-and-drop your jpeg or png image file over the upload button on the left side of the page. 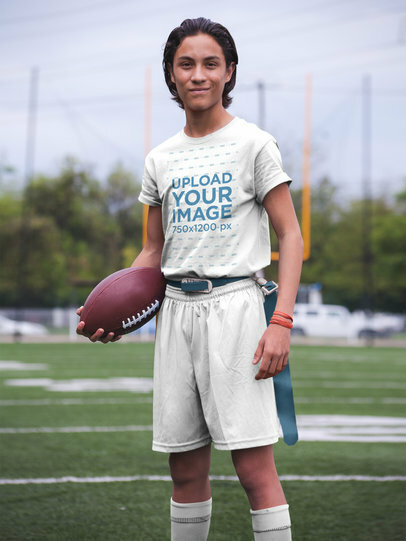 Start using Placeit to promote your personalized football jersey in a smarter way! Try another Football Uniform Designer! Do you have any feedback or is there any other type of jersey do you want to see? Email us! 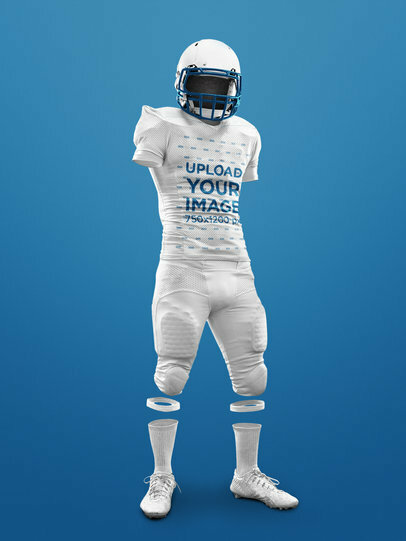 Take a look at this beautiful football uniform designer by Placeit! You can now promote your own custom football jerseys in a gorgeous and serious way: use the menu on the right side of the page to choose her uniform's colors, then drag-and-drop your design image file over the upload button on the left side of the page to merge it with her jersey. It's as easy as that! Try another Football Uniform Builder! Do you have any feedback or is there any other type of jersey do you want to see? Email us! Take a look at this beautiful football uniform designer by Placeit, it's a gorgeous visual that you can use if you are looking to promote your latest designs to your audience in a beautiful and photorealistic way. 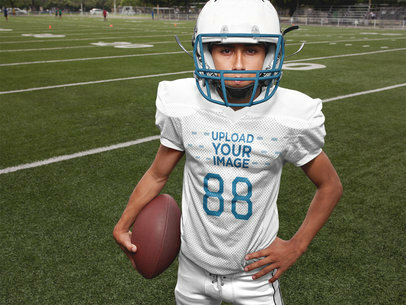 Promote your youth football uniforms in a better way with Placeit! Use the menu on the right side of the page to choose this kid's clothes colors, then drag-and-drop your jpeg or png image file over the upload button on the left side of the page. It's as easy as that! Try another Football Uniform Designer here! Do you have any feedback or is there any other type of jersey do you want to see? Email us! 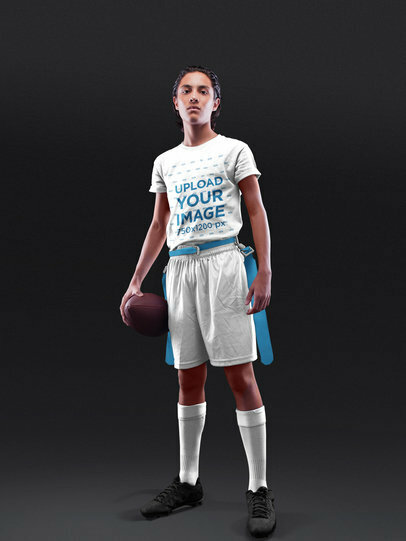 Take a look at this awesome football uniform designer by Placeit! 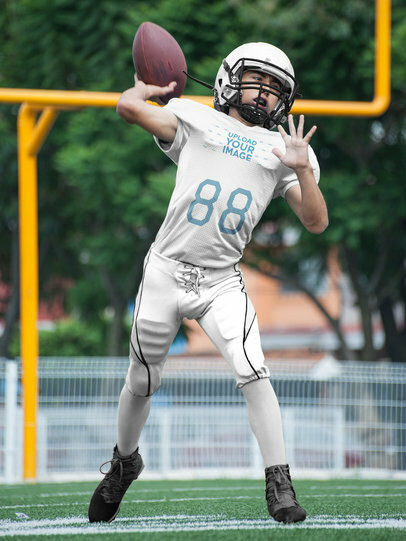 It's featuring a kid about to throw the ball at the field, you can promote your latest design for youth football uniforms in a photorealistic and awesome way. Start now, the menu to the right will let you choose this kid's uniforms colors, then drag-and-drop your jpeg or png image file over the upload button on the left. We will merge your design in just seconds! Try another Facebook Ad! Do you have any feedback or is there any other type of jersey do you want to see? Email us! 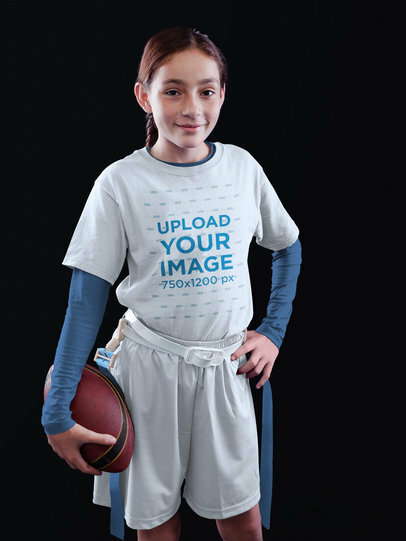 Showcase your youth football jerseys in a beautiful and photorealistic way, use Placeit! The menu on the right will let you choose a color for his clothes, then drag-and-drop your jpeg or png image file over the upload button on the left side of the page. Super-easy, right? Use this image to promote your custom football shirts in an easy and beautiful way. Try another Football Uniform Builder! Do you have any feedback or is there any other type of jersey do you want to see? Email us! Take a look at this awesome football uniform designer by Placeit, this visual asset is a great choice if you are looking to promote your latest designs for youth football uniforms in a beautiful and photorealistic way. Start using it now, the menu on the right will let you choose the colors for her uniform, then drag-and-drop your jpeg or png image file over the upload button on the left side of the page. After a few seconds you'll see the merged image on your screen. Try another Football Jersey Maker! Do you have any feedback or is there any other type of jersey do you want to see? Email us! 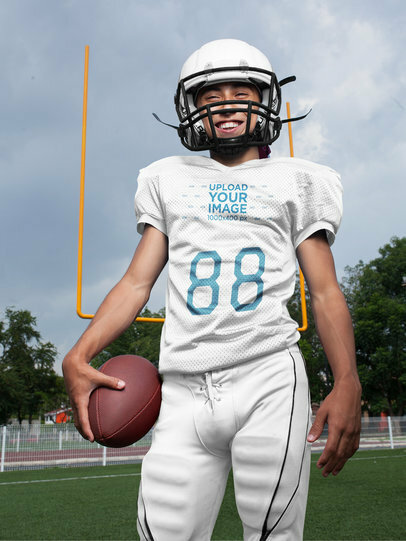 Showcase your latest design for your youth football uniforms with Placeit! 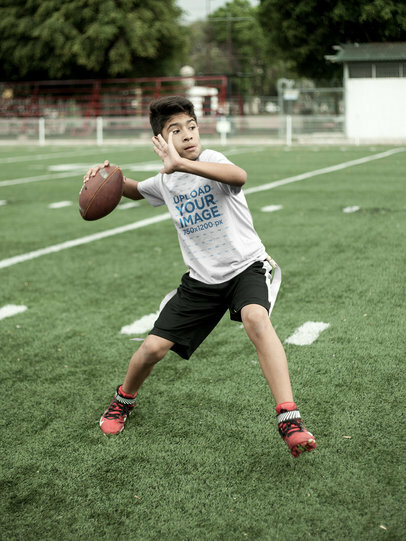 Use this awesome football jersey maker to create your own personalized football jersey for kids. Start now, the menu on the right will let you choose a color for her clothes, then drag-and-drop your jpeg or png image file over the upload button on the left. Start using Placeit now to promote your designs in a more beautiful and photorealistic way! Try another Football Uniform Builder! Do you have any feedback or is there any other type of jersey do you want to see? Email us! 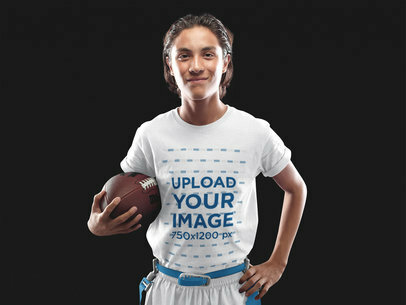 Showcase your latest design for youth football uniforms using Placeit! Use the HEX tool on the right side of the page to choose this little kid's clothes' colors, then upload your design using the upload button on the left and voila! In a couple of seconds you'll see the processed image. Amazing, right? 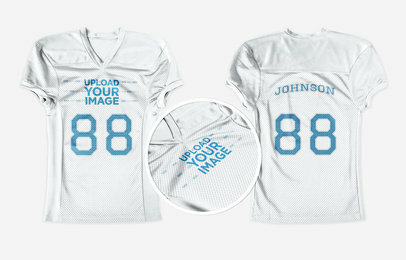 Start using Placeit to showcase your latest personalized football jersey in a more beautiful way. Try another Football Uniform Designer! Nead a team logo? Give our football logo generator a try! Do you have any feedback or is there any other type of jersey do you want to see? Email us! Take a look at this awesome football uniform designer, you can start using it to promote your latest custom football jerseys to your audience in a more photorealistic and beautiful way. Start now choosing this little kid's clothes' colors with the menu on the right. Then drag-and-drop your jpeg or png image file over the upload button on the left side of the page. 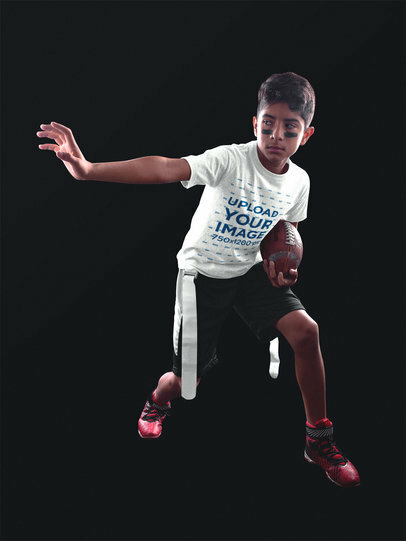 Use Placeit and showcase your youth football uniforms in a better way! Try another Football Jersey Maker! Have a look at our best football jersey mockups. Do you have any feedback or is there any other type of jersey do you want to see? Email us!